My rating: 9/10. Excellent watch. Popular all black design. Today I’m doing an Armani Exchange AX2104 review. The Armani Exchange sub-brand was created by Giorgio Armani in 1991. 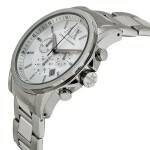 Their range of watches bring a premium look and feel to the masses with an affordable price. From stylish bold timepieces to delicate and elegant choices, they have something available for everyone. 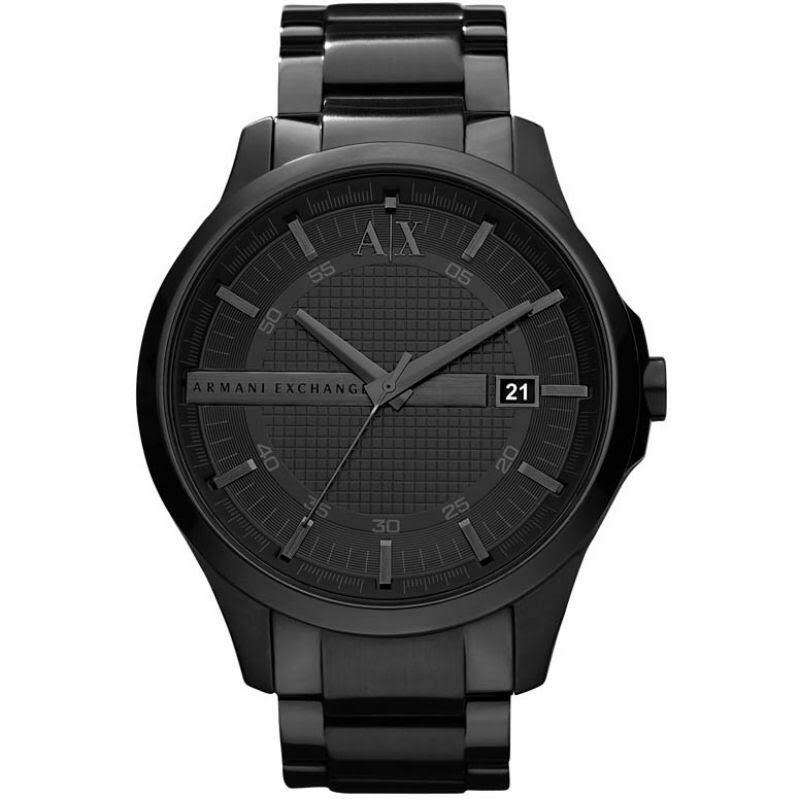 The model I’m showcasing today is the Armani Exchange AX2104, it’s one of the most popular Armani Exchange watches available and with it’s sleek all black design and affordable price, it’s easy to see why. 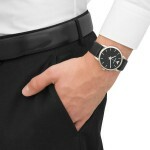 All black watches are very on trend at the moment, they’re very stylish and look great on the wrist. The only problem that I feel I have to mention is the fact that they really can’t be read in the dark at all. I know that’s a fairly obvious point if you look at the watch, but it does need to be said. This model features a Japanese Quartz movement for extra accuracy and has a small date display with white numerals to make it stand out. The casing of the watch has a diameter of 47mm which would make this an oversized style watch, another very on trend style at the moment. The thickness of the case is 12mm, so fairly standard. Band Stainless steel black ion plated, standard length, fold over clasp. Case Stainless steel casing black ion plated, sizing diameter: 47 mm and thickness: 12 mm. Water Resistant A water resistance of up to 50m / 50 bar. The Armani Exchange AX2104, with its all-black style and oversized design, was bound to be popular, throw the designer brand name and affordable price tag and you’ve got yourself a best-selling watch. With all that in mind, it’s very clear why this watch has been so popular. If you’re into your designer watches and want something that looks incredibly sleek on your wrist then I highly suggest checking this watch out. After taking everything into account, such as design, build quality and price, this watch received a well deserved 9/10 from The Watch Blog. 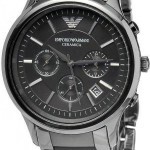 Hope you enjoyed this Armani Exchange AX2104 review. Find more watch reviews below.